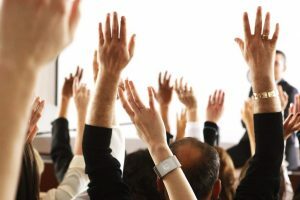 Raise your hand if you think your utility marketing efforts are misguided. Yeah, that’s what I thought. But rather than call out your utility’s marketing team, a less-confrontational approach might be to consider third-party research. That’s what today’s post is all about. You’re not saying it, I am. For years and years, corporate checkbooks have played an outsized role in utility marketing endeavors, whether it was efficiency programs or some other endeavor. I’m referring to rebates, incentives and other cash utilities spend to understand the market, or prime the market, or transform the market, or shift the market, or outright buy the market. Communications Tip of the Month: Money is only one of several tools at the disposal of utility marketers. 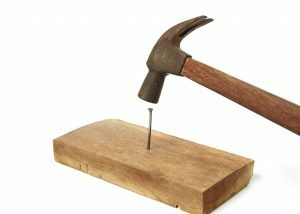 If the only tool you have is a hammer, every problem starts to look like a nail. That’s no way to build an effective marketing program. Utility Marketing Programs: Checkbook or Creativity? Earlier in my career, I worked for a well-regarded electric utility that was fighting marketing incursions from a gas utility. We had long dominated the market for residential new construction by incenting builders to put in electric heat pumps (instead of air conditioners and gas furnaces) in the homes they were building. The gas utility wanted to get furnaces into those new homes. Back then, my utility’s primary weapon was its checkbook, and for a while, it worked: over 75% of all new homes built in the area had an electric heat pump. But then, it failed, largely because the gas utility had more creativity than we had money. 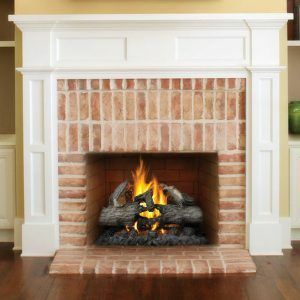 The gas utility, which was much smaller than my electric utility, had convinced homebuilders that gas appliances like fireplaces, grills, spas and cooktops, were part of the “upscale Southwest lifestyle.” Newly built homes that lacked those gas appliances would sit on the market, unsold, for longer than homes that had those desired appliances. The gas utility convinced the area’s largest homebuilder, and the other homebuilders quickly fell into line, eager to make sure their product was competitive with other homebuilders. Within a few years, the new-home market went from 75% or more total electric to 75% or more dual energy. Raising the incentive levels did nothing to stem the loss of market share. And, if memory serves, we did better at preserving our share of total electric new homes than the other all-electric utilities in the region that were competing with this scrappy gas utility. Make no mistake, both sides used money as a tool. And I’d never say that money was unimportant. But it’s only one of several tools at the disposal of utility marketers. If the only tool you have is a hammer, every problem starts to look like a nail. That’s no way to build an effective marketing program. That was one of the points I tried to drive home in my recent article for Public Power magazine: That the size of the rebate is not the critical factor in determining the success of an energy efficiency program. Yes, dollars are important. No, they are not the be-all and end-all that determines a program’s success. Shortly after that article was published, I spoke to Ward Eames, founder and president of The National Theater for Children (NTC). If you don’t know about Ward and his organization, which has been around for 40 years, you should. They work with a wide range of energy utilities, including American Electric Power, Duke Energy, Public Service Electric & Gas, PPL Electric Utilities, Southern California Edison and others, to deliver programming for children around energy efficiency. 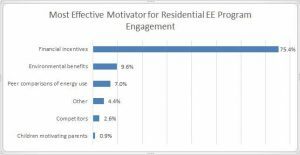 The overwhelming majority of utility executives surveyed, 75%, said financial incentives were the most effective way to get residential customers to engage in energy efficiency programs (see graphic below). But the belief in the power of the dollar is not moving the needle. Only about one-third (34%) of those surveyed felt their utilities were doing a good job educating customers and motivating them to take the actions the utility wanted. About the same percentage (35%) felt they were doing “average” while one-fifth (20%) said they were doing a “poor” job. Those numbers mirror the findings of the first NTC survey, released in 2015. The marketing roadmap to which Ward refers has long existed. Decades ago, Gary A. Steiner, an academic, and Robert J Lavidge, a marketing practitioner, created the marketing hierarchy of needs (below), based on their complimentary work in the classroom and the field. The NTC focuses on energy education to build awareness and knowledge. By performing fun, energy-related theater pieces in front of school children, the group tries to make energy real to the children and their teachers, then asks them to spread the word to parents and peers. For that article, I interviewed energy efficiency officials across the country. They told stories about successful programs that succeeded, in large part, because they were simple. And they told of unsuccessful programs that were not made successful even when rebates quadrupled. Spring has just arrived. Is the time ripe to take a fresh look at your utility marketing programs? Is your utility relying too heavily on its checkbook to achieve marketing goals? What other tools or tactics need to be considered or reconsidered? Dollars are not the most important factor driving success in utility rebates. 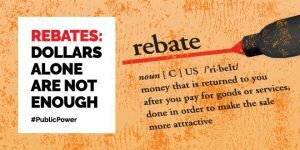 The size of a rebate is not a trivial matter, but it is not, by itself, enough to overcome complex rebate programs or lack of market demand. Other factors, such as program simplicity, customer knowledge, and contractor channels, can be just as critical in successful rebate programs. Read the full article by John Egan here.